The movie Di Ren Jie is currently shooting in Hengdian. 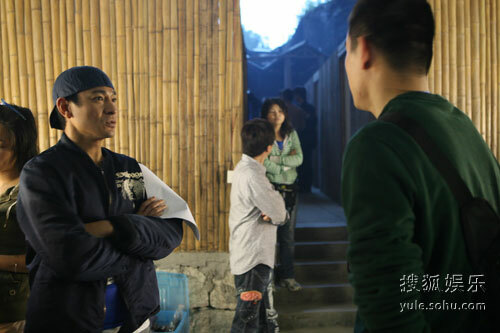 Yule.sohu.com managed to visit the makeup room and got some photographs of Andy Lau and Li Bingbing. In the makeup room, both of them could be considered as “one quiet one active”. The “active” one is Andy whom kept discussing about table tennis with crew members, his understanding of the game does not lose out to professional critics. The “quiet” is Li Bingbing is the “quiet” one whom did not forget to read the script while being make up, her professionalism is amazing. Being a role model artiste, Andy has always been going in the direction of “know-all”, no matter how busy is hem he would do sports. Earlier when he was visiting in Sichuan, Andy also spent time to play table tennis and pool. Andy who love the ball game also like to talk about the ball game. Recently when location shooting in Hengdian for Di Ren Jie, Andy kept discussing about table tennis with the crew members. Although shooting overnight, Andy still know all about the results of the ongoing Table Tennis World Championships, when talked about table tennis, he immediately got excited. Andy commented about Ma Lin and Wang Liqin, talking about mentality and technique, Andy’s level of understanding of the game does not lose out to professional critics, the crew members could not join in the discussion and could only be the listeners. While Andy was busy chatting, Li Bingbing was the quiet one. She immediately sat in front of the mirror to undergo makeup. Li Bingbing did not laze around as she also took the script to read. It was said that Li Bingbing join the cast later than Andy thus she was less familiar with the script thus need some time to do her “homework”.